"This is the film festival that I really love. I feel the joy, the pure happiness, the enthusiastic crowd to see films. It's really specials." I'm talking about Purbalingga Film Festival. If you happen to travels in Central Java in July, you'd better come to this festival. It has a very distinctive atmosphere. While in Purbalingga, you can also enjoy the leisure program offered by the festival committee. In this program, you will be invited to visit the countryside with the festival crew on a pickup truck through a challenging journey. You will participate and play the movies for the locals. I still remember clearly when I came to the festival, I was sitting on the ground with the crowd, watching the open-air screening. They were playing new movies produced by their children. We were laughing, smiling, enjoying the films. Sometimes it was difficult for me to understand the story of the film. But it doesn't really matter. It was a beautiful night. I could smell the green grass, and the petrichor too. To give you more context: Purbalingga is a small town located on the slope of the highest mountain in Central Java. The same region as Mr. Sururi and his horse, Luna. The majority of the community are farmers and some work as laborers in the manufacturing sector (this region is well known for their wig industry). Purbalingga is located in Banyumas region. This region often regarded as an area with no prominent historical record related to arts and cultural activities compare to other cultural cities like Solo, Jogjakarta, Jakarta or Bandung. This region is known for their distinctive dialect too. However, from 2007 until now, Purbalingga has been transformed into one of the important references for the implementation of the Film Festival in Indonesia through the Purbalingga Film Festival. This is one of a kind festival that really speaks about their own culture and identity. I don't find this kind of strong local flavor in another film festival in Indonesia. The Purbalingga Film Festival is organized by a community called Cinema Lovers Community (CLC) independently. This small community covers the financial aspects of the organization, provision, and curation of the film, as well as the development of themes and film production. The films played in the festival highlight the social issues that exist in the region. The issues and localities of Banyumas culture became a strong identity in the content of the movie being played. Community empowerment is the core power of this festival. From open-air screenings in the village field to an air-conditioned cinema building, it's all the same, film is an entertainment and an art that easily absorbs public attention. Seeing how this film festival works, I do believe that film is not only meant as a work of art but more as a "social practice". It's not just an artistic expression of the creator. But also involves the complex and dynamic interaction of the supporting elements of the film production, distribution, or exhibition. Even more, we could see the interaction between films and cultural ideologies in which the film is produced and consumed. The existence of CLC affirms the opinion of the film as a social practice. 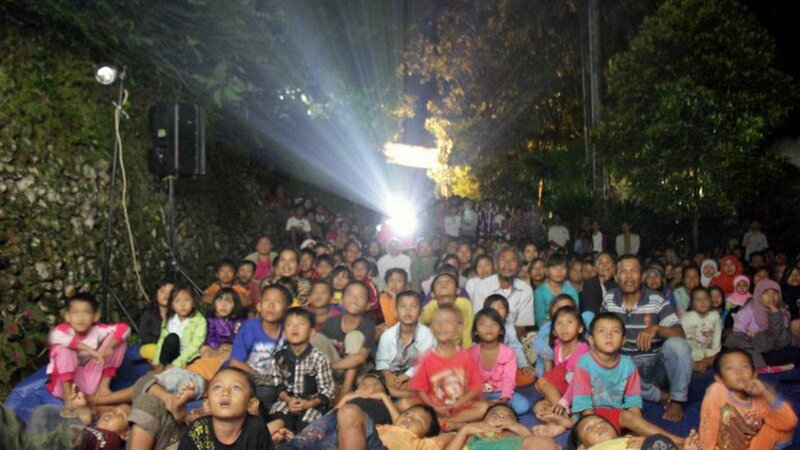 CLC activities are facilitating community-based film activities in Purbalingga. One of their distinctive identities is to bring the film to its community by holding open-air screenings in the villages. Some villages are located up high in the hill. You could see the screen with the great mt. Slamet as the background. It was so fascinating. The films of the young Purbalingga filmmaker did not stop at the regional level but were able to compete at the national level. At the Film Festival Indonesia (FFI), which is the highest level of Indonesian Film awards, the short film by Purbalingga students always become a nominee or even won the award. That is the role of CLC. In this case, the CLC applies the method that is hard to find in other film communities: going down the field for research and socializing with the grass root. This method makes them directly involved in social advocacy in Purbalingga and its surroundings. Their way to popularize the film as a social critique medium is unique. They include the film as part of an extracurricular program in Purbalingga high schools. So far there have been hundreds of films - mostly take on issues such as labor, gender, corruption, politics and so on-produced by children and teenagers. There are many obstacles in the implementation of the Purbalingga Film Festival. 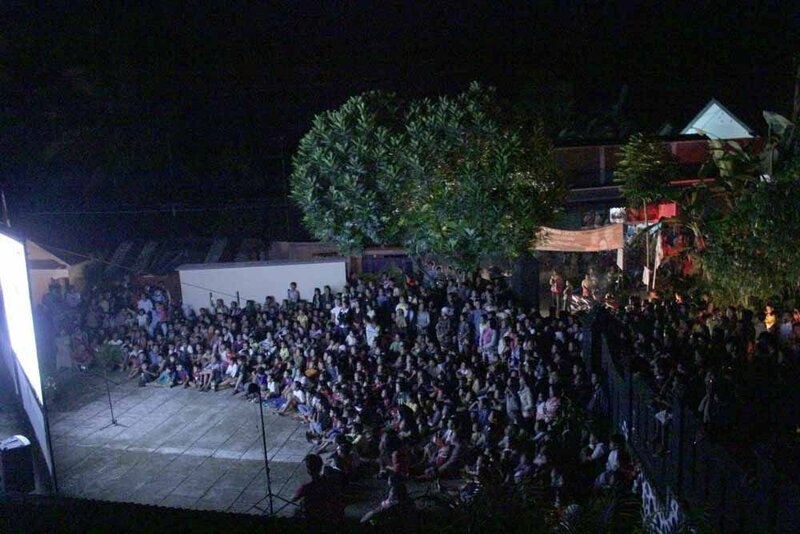 Before the open air screening was spotted, film screenings were held at the Building owned by Purbalingga Government. But it did not last long, because then there was ban from the District Government. Maybe because the films are too critical for the government. I don't really follow the history. But as far as I know, to further promote local films, the existence of open-air screening programs around the village becomes vital. Because basically, people living in cities and in the villages have the same rights to accessing movie shows. Now, the open-air screening dubbed 'Layar Tanjleb' eventually became a special icon for the Purbalingga Film Festival. There are several things from the Purbalingga Film Festival which make it unique compared to other festivals. One of them is the courage of the organizers to hone the skills of filmmaking for local students, initiating movie-watching programs with their neighbors (by utilizing the home's yard). They also have a very local way to announce the open-air screening events. They will wander around the village with a car or motorcycle, with an old microphone, and then start to invite the villagers to come, loudly. Sometimes they will allow us, visitors, to join the car. While other Film Festival trying so hard to looks luxurious and elite, the existence of the Purbalingga Film Festival actually shows that the cinema should be enjoyed by all people. Seeing the crowd at this festival, I see happiness. I see joy. That is the love for cinema.